This close up from a photo by NASA's Mars rover Curiosity shows the Martian moon Phobos as a faint crescent in the Martian evening sky. The black blemish is the result of a bad pixel in the image data. Image released Sept. 26, 2012. NASA's Mars rover Curiosity has been doing more than just driving around the Red Planet and taking pictures of rocks. It's been doing a bit of Martian moon-gazing too. The Curiosity rover's latest Mars photo captured the planet's largest Martian moon, Phobos, during a Martian evening, revealing the satellite as a faint crescent moon. "Moon Over Mars: I snapped a pic of one of Mars' moons, Phobos, in the twilight sky over Gale crater," NASA's Curiosity team announced on the mission's Twitter page @MarsCuriosity, writing as the rover itself, on Wednesday (Sept. 26) — the same day Curiosity made its longest drive yet.  The photo shows Phobos as a faint white crescent that almost blends in with the Martian sky. A black blemish also appears in the image, but is merely the result of a bad pixel in the image data, rover officials said. "When you send images from 179 million miles away, stuff happens," they added via Twitter. The new photo of Phobos is Curiosity's latest view of Martian moons from the surface of the Red Planet. Earlier this month, Curiosity snapped photos of Phobos as it crossed part of the sun, creating a partial solar eclipse on Mars. Mars has two moons, Phobos and Deimos, both of which are much smaller than Earth's moon. Phobos is about 14 miles wide (22 kilometers), making it the largest Martian satellite. Deimos is about 9.3 miles across (15 km) at its largest point and is farther from Mars than Phobos. NASA's Mars rover Curiosity snapped this photo of the larger Martian moon Phobos during a Mars sky observing session. Phobos is Mars' larger moon, but only 14 miles across. Image released Sept. 26, 2012. The Curiosity rover's Phobos photos are just part of the science work the car-size robot has been performing on Mars. The rover landed inside the planet's vast Gale Crater on Aug. 5 and is currently driving toward its first science destination, a location called Glenelg. On Wednesday, Curiosity drove 160 feet (48.9 meters) closer to Glenelg, marking its longest single drive of its mission so far. To date, the rover has covered about a quarter-mile (416 meters) on Mars. NASA's Mars rover Curiosity is expected to spend at least two years exploring Gale Crater to determine if the region could have ever supported microbial life. Mission scientists plan to drive the rover up a 3-mile (5-km) mountain — Mount Sharp —that rises from the crater's center. NASA will hold a press conference today at 2 p.m. EDT (1800 GMT) today to update the media and public on Curiosity's progress on Mars. You can watch the press conference live on SPACE.com here.